Quebec’s anglophones have a lot of problems with the government and on Friday, they let the minister responsible for them hear about it. Over several months, the provincial government held online consultations, the results of which showed the province’s English-speaking minority feels neglected and hurt. 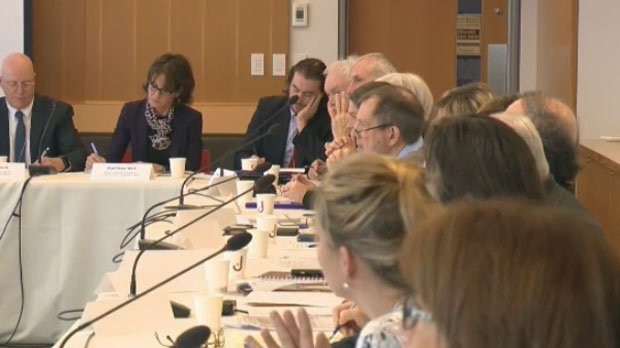 On Friday, Quebec’s Minister Responsible for English-Speaking Quebecers Kathleen Weil held a forum to discuss the survey’s findings. "This is the first time the Quebec government has actually had a dialogue with the English-speaking community and looking to get a good diagnosis of all the issues the community faces all over Quebec," said Weil. According to the report, Quebec’s anglophones feel isolated, particularly outside Montreal. They also believe they are under-represented in the public service, complain of youth leaving the province to seek opportunities elsewhere and that poverty among English-speakers belies the perception of the wealthy anglophone. Those who stay in the province have a harder time finding work, with a youth unemployment rate of 11.1 per cent. “There's still that exodus based on the statistics which is very frustrating for us because we see about 4,000 people at our centre and this is because they want help in staying in Quebec,” she said. Weil said she wasn't discouraged or surprised by the survey's results. "What's really encouraging is these people can point to exactly where the problems are," she said. "Then it's just a question of getting the government... to look through that lens and adjust their programs and policies." Among those who met with Weil were leaders from the anglophone community, including attorney Eric Maldoff, a longtime proponent of English rights. Maldoff said the survey and the naming of a minister for anglophone affairs are good first steps but systemic change is needed to ensure proper respect for the anglophone community. Among the most pressing issues raised in the survey is the lack of anglophones in the public service. While anglophones make up roughly 10 per cent of Quebec's population, they are just over one per cent of public servants. Weil admitted that the public service has an issue with diversity in general and said she plans to work with universities to create stages and programs to attract anglophones to the public sector. Another issue is isolation, especially for anglophone communities outside of Montreal. Access to services in English is difficult is more remote areas, including the Magdalene Islands, where a community of 700 anglos live. With an election looming in November and the rival Coalition Avenir Quebec leading in several recent polls, both parties have been making pitches to anglophone voters. "I don't think you can woo (anglophones) when you are doubtful about your capacity to change things for the better for them," said Weil. Weil noted that the Liberals have vowed to make the recently formed secretariat devoted to anglophones a permanent position, something that CAQ leader Francois Legault has not done. The results of the survey and consultations are expected to be compiled into an action plan that will be presented to the National Assembly in June. Quebec’s Minister Responsible for English-Speaking Quebecers Kathleen Weil meets with leaders of the province's English-speaking community on Friday, Feb. 16, 2018.